LT School is Responsive School Joomla template. This template is well suited for colleges, schools, the universities, kindergartens, online courses and other education related websites. LT School supports mobile devices with 100% responsive layout. 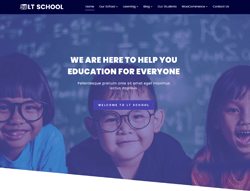 School Joomla template also builds with bootstrap based on strong template framework with strong shortcodes, unlimited positions, drag-drop layout and 4 color styles. This is the right template to create professional and custom looking website for any educational purposes.